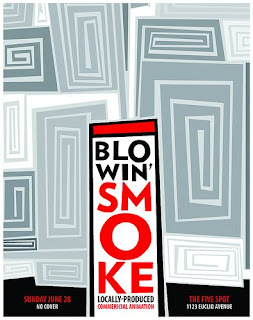 This Sunday, June 28th, at 8pm we have our annual showcase of locally-made commercial animation, Blowin' Smoke at Five Spot! The event is free and is a wonderful opportunity to get a glimpse at the animation industry that's right here in Atlanta. We're proud to be showing work from Turner Studios, including an unaired pilot called "Avery Matthews" by the guys who brought you "Harvey Birdman"! We are also very happy to be showing work from local studio Primal Screen! Also, for the first time, local studio Awesome Incorporated will be showing work at this event- we may have more material from other local studios but some of it is up in the air. We'll also be showing work from local freelancer and animator Joanna Davidovich. Thanks for the submissions, guys! Animation Draw 3 went great last Saturday; thanks to those who came out and drew with us! We've scheduled another for July 25th at WonderRoot. It's likely we will include all of these collaborative animations on our International Animation Day DVD which we will send around the world. Plaza's showing Spike and Mike's Sick and Twisted Festival of Animation, starting July 3rd and running for a week. Should be good!